Product Inquiry Magento 2 Extension help store owners to increase more sales by clearing customer’s product-related doubts and questions quickly. The Magento 2 Product Inquiry Extension is a must have extension for the store owner. The real-time customer is going to purchase only if he is clear with what he is going to receive. Now being clear with the deliverables ultimately boosts the sales. Our Product Inquiry Magento 2 Extension enables the potential customer to submit their inquiries related to any specific product to the store owners. The admin will receive an email notification whenever a new inquiry is submitted. Our Magento 2 Product Inquiry Extension allows the guest users to submit the inquiries regarding any specific product without sign up. This is extremely beneficial as the user need not to sign in or sign up at the store. Allowing the guest users to submit the inquiries provides flexibility to the users and also favors conversion rate. 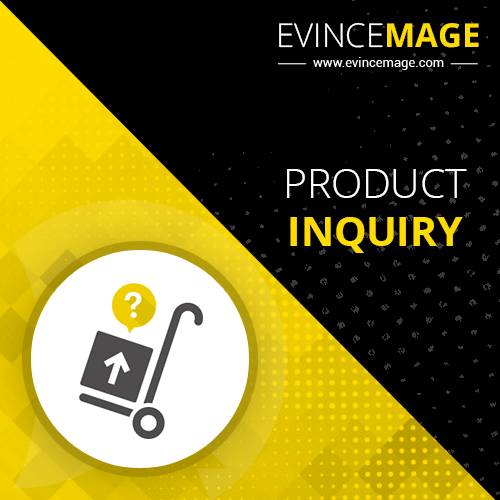 Our Product Inquiry Magento Extension allows the admin to track all the previous inquiries from the admin panel. Not only the processed ones, but the admin will also be able to see all received inquiries for the products at one place. Furthermore, the admin can also apply the filters to select a particular set of inquiries satisfying the set of parameters making the process hassle-free. Our Magento 2 Product Inquiry Extension provides email notification to the admin as soon as the inquiry is submitted by the user on the store. Our Product Inquiry Extension for Magento 2 offers delay free experience to the end user enabling the admin to provide the response to the submitted inquiries. Our Magento 2 Product Inquiry Extension places “Inquire Now” button just below the product price. Just one click on “Inquire Now” button and the user can submit the product inquiry. Our Product Inquiry Magento 2 Extension offers you to filter inquiries by name, date, etc. This outcasts its advantages when handling bulk inquiries thus favoring easy-to-handle support to admin. Our Magento Product Inquiry Extension facilitates the admin to create multiple views by selecting the customized attributes from the “Column” section. Once the admin has selected customized attributes, our Magento 2 Product Inquiry Extension allows admin to save that view as customized one by navigating to “Default View” and then “Save View as.” The admin can even rename the view as per convenience. Additionally, Product Inquiry Magento 2 Extension also offers admin to delete the submitted inquiries as per convenience. As per as the installation ease is concerned, our Product Inquiry Magento Extension can be installed in the matter of few clicks. The admin needs to configure “Thank You” message and “Email address” to receives the product inquiry and that’s all.